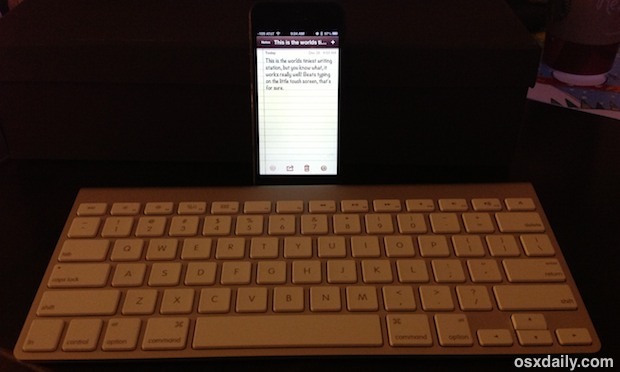 External wireless keyboards can be connected to and used with iPhones and iPod touches through Bluetooth. This can help when typing anything of length, particularly if you’re not as fast a typer with the virtual keyboard, and it allows you to create an immediate (albeit tiny) workstation just about anywhere. There’s also a very nice software-side bonus to using an external keyboard with iOS too; the virtual keyboard disappears when an external keyboard is paired, letting you see the entire screen unobstructed while you type. We’ll use an official and generic Apple Wireless Keyboard with an iPhone for the purpose of this walkthrough, but you can use any compatible Bluetooth keyboard and any other iOS device, whether it’s an iPhone, iPad, or iPod touch. This works to sync an external Bluetooth keyboard with just about any iOS device that is even somewhat modern, so whether the iPhone, iPod touch, or iPad is running a new or old version of system software you can connect the external keyboard to it this way. You’ll note the system settings may look slightly different depending on which iOS version the device is running, but the capability of connecting and disconnecting an external wireless keyboard is the same in iOS. 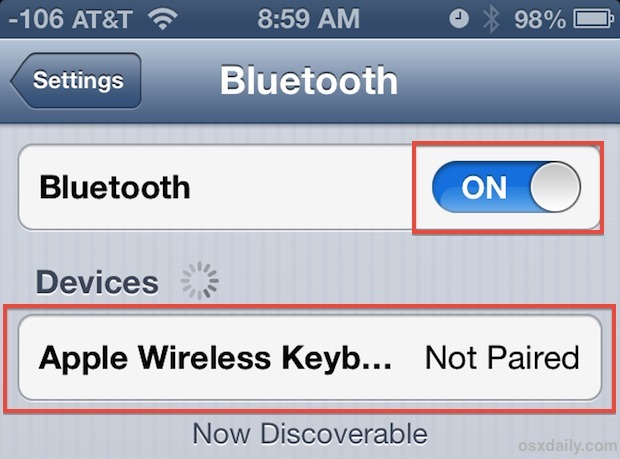 The wireless keyboard will now show as “Connected” under the Bluetooth Devices menu, and you are free to exit out of Settings and use the keyboard as normal with the iPhone in any app. This demo focuses on external keyboards with the iPhone or iPod touch, but you can also connect them to iPad as well. Disabling Bluetooth isn’t an option if you use it for hands free sets, speakers, or other accessories though, so you can also choose to “forget” the device to disconnect it, though you will have to go through the basic pairing and syncing process again when you want to use the external keyboard the next time around. If you don’t have a dedicated external keyboard to use, another option is to use a third party app like Type2Phone, which turns a Macs keyboard into a bluetooth keyboard for an iOS or Android device. Actually the simpler way to a Bluetooth keyboard is to hold it’s power button until it shuts off. That is if you are not using the keyboard for a Mac as well. Does “cmd+L” work in safari to highlight the URL address like it does on osx? Also, can you tab through fields in safari?